Controversy over the inquest jury’s verdict in January 2014 that a 29-year-old unarmed black man was lawfully killed by a police marksman has put an incident that sparked the worst English riots for a generation back in the news. After the shooting of Mark Duggan in 2011, disturbances that started in Tottenham north London, spread to other parts of the country. 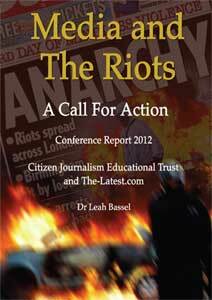 Later that year a conference was held, entitled Media and the Riots, organised by citizen journalism website, The-Latest.Com and the Citizen Journalism Educational Trust. The unique event brought together young people from riot affected areas and media professionals, including journalists and scholars. Afterwards Dr Leah Bassel, a leading young Leicester university social scientist, produced Media and the riots – A call for action, the first report to examine the relationship between mainstream media and the communities affected by the riots. Among other things, it exposed police misinformation that they had been involved in a shoot out with Duggan, a damaging claim peddled by unquestioning journalists. The much-publicised report contains recommendations that pave the way for much better news reporting. Britain’s leading media commentator Roy Greenslade, of The Guardian, wrote the foreword. He said “the tone and focus of the report is less about complaint and more about urging people to adopt strategies to build relationships with the media”. To that end, the report offers a five-point guide to practical and positive action by those who feel marginalised by the press (and society): 1, hold the media to account; 2, engage with journalists; 3, communicate with decision-makers; 4, promote citizen journalism; and 5, ensure access to journalism by a wider selection of entrants, including Black people. Read Greenslade's blog on the Guardian website about the report. There has also been positive coverage in The Voice newspaper.